Tendon or ligamentous sprain During postoperative or rehab phase. If used with the Achilles Wedge Kit, Achilles ruptures can be treated as well. The Achilles tendon is highly vulnerable to injury because of its limited blood supply and the combination of forces to which it is subjected. Current protocols suggest that immobilization and gradual reduction of plantar flexion are recommended in the treatment of Achilles ruptures. 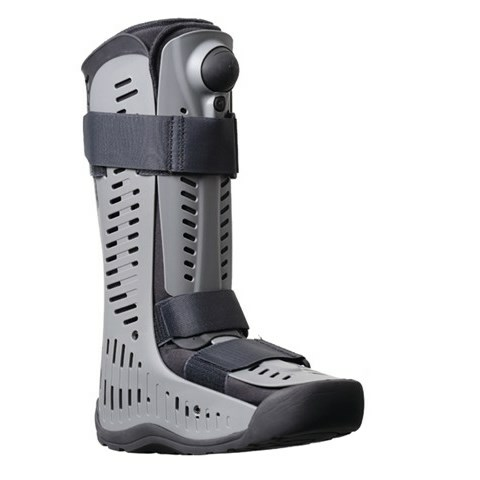 The Rebound Achilles Wedge Kit, used in combination with the Rebound® Air Walker, provides an optimal solution for both functional (non-surgical) and postsurgical treatment of Achilles ruptures. The Rebound Air Walker provides immobilization, protection and comfort, while the Rebound Achilles Wedge Kit provides adjustable angles of plantar flexion that can be easily modified through the rehabilitation process. Its lightweight construction and anatomical design improve patient comfort while the patented universal arch support helps maintain heel position within the walker.